A field "upload image" creates an interface for image selection. The selected image is loaded into a server directory, when it is submitted by a form. According to the settings of this field, one or more thumbnails (thumbnails) are created. Moreover, a title and a description are added to the image and its thumbnails. Write the name of the server directory in which the selected image is loaded. This name must be post-fixed with "/". For example, "images/", "images/photos/", and so on.. For the rest of this description, consider "images/" directory as a value of the "folder" parameter. Optional, write the full path to the default image (directory + filename image). 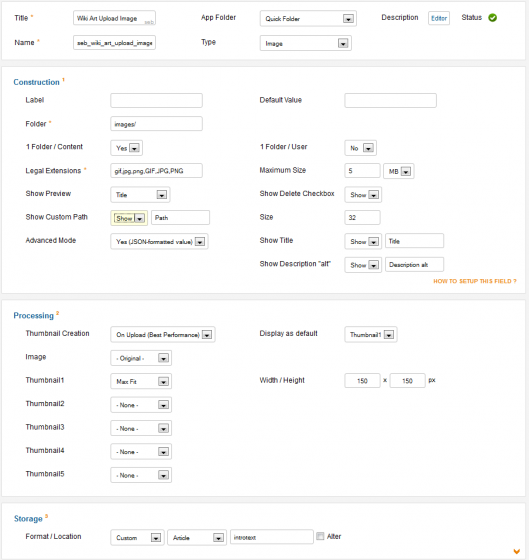 It is applied at first when the form is loaded. (Override) The default value of a field is overwritten by the value entered directly into the editing interface for a content type. 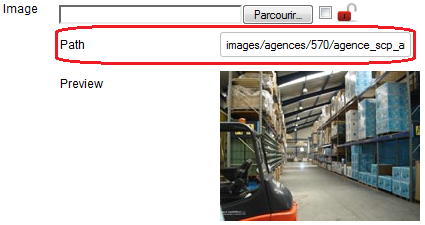 Optional, select (Yes) to choose to load the selected image in a directory specific to an article. The name of this directory is: the value of the "folder" parameter + the identifier of the article created after the form submission. For example, if the created article is characterized by the identifier "124", then the selected image in the form ("image.jpg" for example) is loaded into the directory "images/124/". Optional, select (Yes) to choose to load the selected image in a directory specific to the user who performs this operation. The name of this directory is: the value of the "folder" parameter + the user "id". For example, if "user1" with identifier "64" load image "image.jpg" then this image is saved in the directory "images/64/". if the two previous settings "1 Folder / Content" and "1 Folder / User" are on (Yes) then the selected image is loaded in the directory: the value of the "folder" parameter + the identifier of the user + the identifier of the created article. Write the authorized extensions of the images to load. By default, this parameter contains the value "jpg, JPG, PNG, PNG, GIF, GIF." Write the maximum size of the images to load. By default the value of this parameter is "5 MB" (5 megabytes). If no limits are required then write 0. Option 8 (Title): the title of the image file. Optional, select (Yes) to allow the deletion of the loaded image when editing an article. This deletion is done by checking the checkbox. Please note, no warning message appears. Make sure you want to delete the image before you check the checkbox. 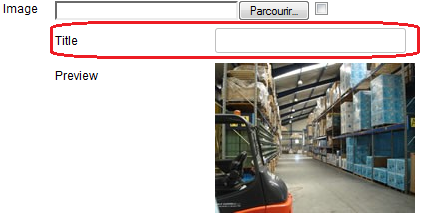 Optional, select (Yes) to change the image directory (designated by the parameter "folder") in the form. Use this option if you want to change the path of some images loaded by this type of field, not all. Write the input size of this field. Optional, select (Yes) to add a title and/or a description to the loaded image. Optional, select (Yes) to add a title to the loaded image. Modify the label of the input text (used to add a title to the image in a form) by changing the value "Title" on the right of drop down "show title". Optional, select (Yes) to add a description to the loaded image. Modify the label of the input text (used to add a description to the image in a form) by changing the value "Description "alt"" on the right of drop down "show description". On upload (Best Performance): thumbnails are created only once when loading the image. This mode is appropriate when the website is in production for best performance. Always (if doesn't exist): thumbnails are created if they does not exist. This option is useful if after downloading images, you realize that you need to create another type of thumbnail. Always: thumbnails are always created, whether they are in "admin form", "site form", "content" and "intro" views. This mode is appropriate when the website is in development. When options "always (if doesn't exist)" and "always" are selected, the thumbnail creation occurs in the edition of a form but also in the "content" and "intro" views of an article. Select options "always (if doesn't exist)" and "always" only when you change the settings of thumbnail creation procosses during the exploitation of your website. Option4 (Stretch): resize the original image with new dimensions. Option4 (Stretch): create a thumbnail by resizing the original image with new dimensions. write width and height of the uploaded image and / or created thumbnail.